Epiphytic banyans, not strangler figs, are growing on this ironwood tree located near Kailua District park. Lester Chang, director of the city Department of Parks and Recreation, said the banyans will be removed soon. Question: There are at least two big old ironwoods in front of Kailua District Park that are now hosting a kind of ficus-tree growth I know only as "strangler fig." 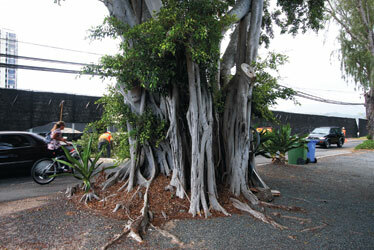 This type of ficus has already completely engulfed another ironwood down the block very close to Aoloa Street. The engulfed tree has now morphed into a huge ficus tree with a few large ironwood stumps sticking out the side. Right now the strangler figs at the park are small enough to remove without much injury to the ironwoods. However, the larger of the stranglers has already sent quite a few roots down into the soil so something has to be done soon. Parks and Recreation is in charge of this stretch of road, I believe, but I also know they're very short-staffed -- which is how the engulfed ironwood happened. Who can I contact to get someone to remove the stranglers from those beautiful old ironwoods? Answer: The city Department of Parks and Recreation, whose Division of Urban Forestry is responsible for the ironwoods along Kailua Road, is "aware of this situation." Epiphytic banyans, not strangler figs, are the plants growing onto the ironwoods, said Lester Chang, director of the city Department of Parks and Recreation. So the situation is not the dire. Epiphytes are plants that grow on other plants for physical support, but not for nutrients, while strangler figs will totally consume a host tree, killing it over time. "The epiphytic banyans will be removed in the coming weeks by a contractor performing work in an active contract to prune ironwood trees in the Kailua area," Chang said. At that time, all city-maintained ironwood trees along Kailua Road will be pruned, and the health of the trees will be determined. Austin Braaten, an arborist with the Division of Forestry and resident expert on epiphytic banyans, explained that while they are related to strangler figs (both trees belong to the genus ficus), the latter is much more aggressive. "The epiphytic banyans are not that uncommon in our city trees, but are more of a slight nuisance and are removed when detected," he said. A strangler fig, on the other hand, is a general term used to describe several species of figs that aggressively overtake an existing mature tree, Braaten said. "Figs vary in their ecology and growth habits, some figs are purely stand-alone trees, others can grow as epiphytes and others are termed as strangler figs," he said. Epiphytic banyans commonly can be seen sprouting from deep crotches and cavities of various tree species, he said, and Division of Urban Forestry workers "as a habit" will remove them before they start to overtake the host tree. "Typically, these banyans do not strangle the host species, but become unsightly and begin to encroach into the foliage of the host tree, appearing to overtake the host with time." By comparison, a strangler fig will completely overtake a host tree, "rooting in the host's canopy and spreading downward via aerial roots," Braaten said. When the strangler fig's roots reach the soil, it begins to derive nutrients from the soil, generate more roots and, eventually, overtake the foliage of the host tree, he said. "Over time the host tree will die and decay within the grasp of the strangler fig," he said. Whether epiphytic banyans or strangler figs, Urban Forestry officials basically consider them a "slight nuisance" that are removed when detected. In Braaten's opinion, "This nuisance is by far dwarfed by the problem created by careless park users dumping hot coals at the base of park trees or intoxicated and reckless drivers colliding with the city's street trees."